Now before you get concerned that I am confused about what time of year it is, I am aware that it's a little early for Valentine's Day, but it's not the only day to celebrate love! 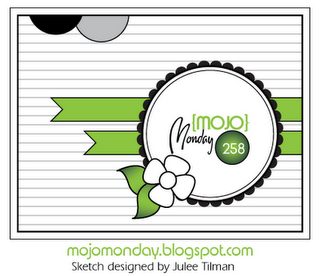 I decided on this theme for this week's Mojo Monday sketch because this card is intended for a trip overseas. Operation Write Home is an organization that gathers handmade cards from crafters all over the country and sends them to men and women serving over seas. They are blank cards inside, so that the soldiers have beautiful handmade cards to send to their families. A card shop, or a craft shop in Afghanistan is not something our soldiers can just pop over to and get a card to send home and let their loved one's know they are thinking of them! I think it's a really awesome program and I am excited to be a part of it! Be sure to check out the OWH website if you are interested too! I purposely kept this a very straightforward and simple design. Most of the OWH cards I will make I plan to "mass' produce, if you can call 25-30 of a similar card a mass production!? There are also some really specific rules for keeping the soldiers safe ( read NO GLITTER! ), and for keeping the cards safe in their transport from here to there. Besides, I really like sweet and simple... It's my preferred design style when I am making things. I love the busy, pretty stuff, don't get me wrong, I just am not very good at it. So I am comfortable with simple. If you are curious, I used my Cricut to cut the shapes. Cartridges: Elegant Edges & Cricut Art Philosophy. A little glue, some foam pops ups and done! I hope you take a peek at Operation Write Home's site and if you are in So. Cal and interested in a card making get together, let me know! I'd love to! 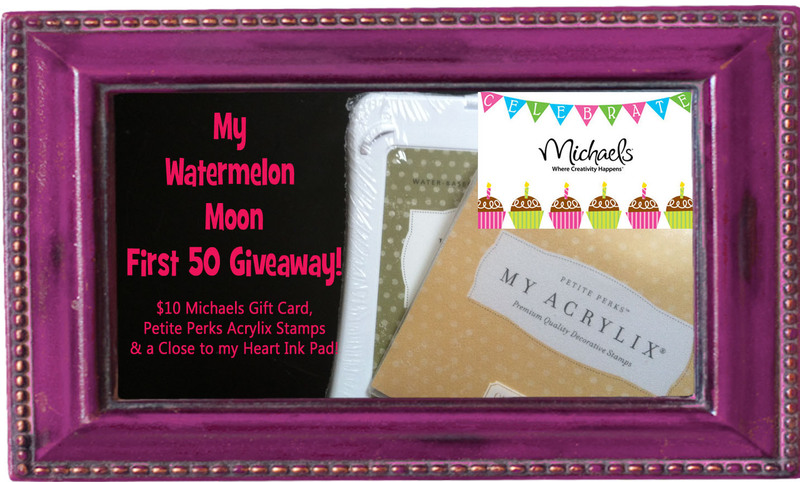 Now did you enter my giveaway? You have a few days left to enter! Just go comment on this post, that's it! 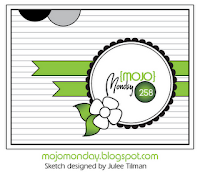 If you are curious what the Mojo Monday sketch I worked from originally looked like here it is! Thank you Pat! :) I'm looking forward to creating lots more! :D What a lovely group of people. What a nice shout out for OWH. Welcome. Like you, I like simple cards and this is a lovely one.